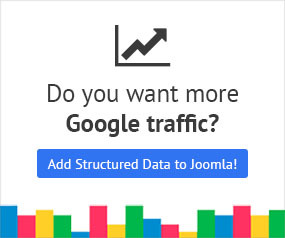 When you notice errors in Google Structured Data Testing Tool related to your articles, it is most likely because Joomla! generates incomplete microdata by default. A rarer occassion is when your template or an extension overrides Joomla's code and still generates incomplete microdata. To try and fix this problem we propose one of the following two methods. Google Structured Data Pro since version 3.0.2 is able to remove microdata which appear to be faulty in the Google Structured Data Testing Tool. All you have to do is determine which Content Type has been reported to give out errors or warnings or both and just enable it through the provided checklist in the screenshot above. This configuration can be found through the extension's configuration menu in the "Advanced" Tab. The goal of this method is to instruct ReReplacer to remove all the occurences of default microdata which cause errors. Download ReReplacer Free and install it. In ReReplacer's dashboard create a new item and follow the steps below to set it up. Type any Title you see fit for your own convenience. In the Search field type the following string. Activate Regular Expressions right next to the Search field. Save & Close. You are done! This method is suggested for advanced users who are familiar with overriding layouts in Joomla! . Override the components/com_content/views/article/tmpl/default.php file and remove the following string. Override the components/com_content/views/featured/tmpl/default.php file and remove the following two strings. Override the modules/mod_breadcrumbs/tmpl/default.php file and remove the following string and you are done!